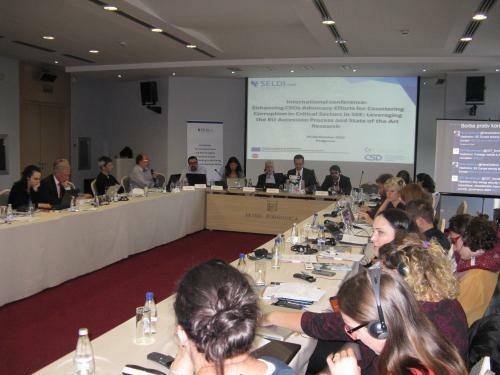 Mr. Ruslan Stefanov, Director of the Economic Program at the Center for the Study of Democracy, Bulgaria and SELDI Coordinator recommended sustained criminal investigation, enhancing the CSOs’ role and focusing the anti-corruption efforts on the most critical sectors. 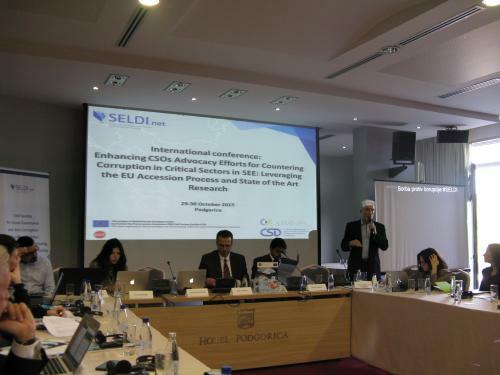 He noted that SELDI is a growing initiative of 30 CSOs in the region, and it will continue to deliver relevant policy options to the national governments. 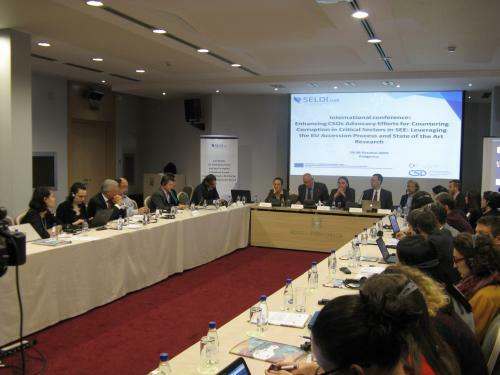 In conclusion, he underlined that regional CSOs should strive to leverage the EU accession process and EU research generated knowledge to reduce corruption risks and pressure in the region. 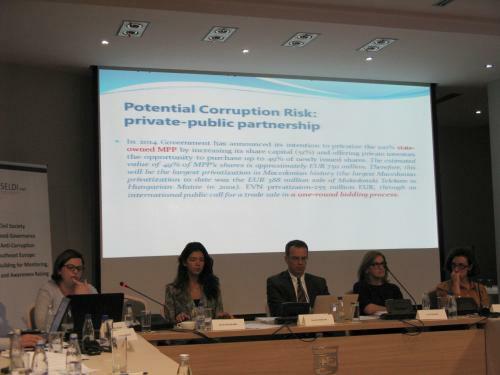 Mr. Milivoje Katnić, Chief Special Prosecutor, Special Public Prosecutor`s Office, noted that since its opening on 3 July 2015 the office has established good communication with all stakeholders, especially the civil sector and the citizens, who report cases of corruption. He underlined that informing the public about indictments and convictions, along with professionalism is key to generating a culture of corruption intolerance. He promised to inform the media in timely manner about the work of the office, as long as it does not interfere with any ongoing investigation and will help journalists to interpret correctly the information. As a main challenge, he identified the need of the country to build democratic society and institutions that work efficiently. 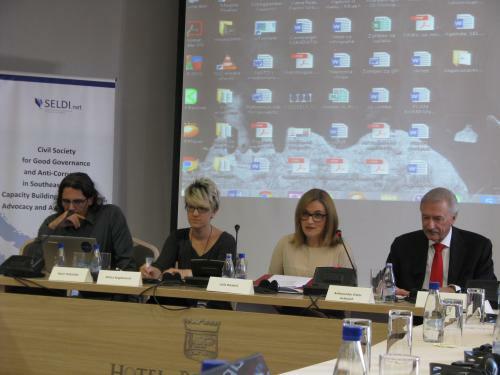 Ms Kirsi Pekuri, Head of Political, European Integration and Trade Section at the EU Delegation to Montenegro highlighted the fact that corruption increases poverty and social injustice, destroys the social fabric and damages democracy. That is why all stakeholders, including the civil society, have to join forces and engage in an open and constructive debate with the authorities, raise awareness, uncover cases of corruption, and advocate for the fundamental human rights. 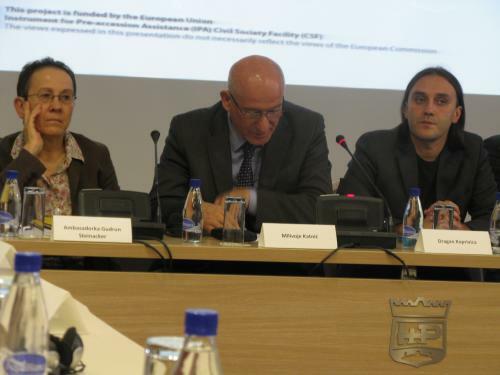 Ms Pekuri stressed that EC will stay by the side of the CSOs and support them in their efforts. Ms Gudrun Steinacker, Ambassador of the Federal Republic of Germany to Montenegro stressed that the fight against corruption will always be ongoing. However, that should not deter the society and the governments. 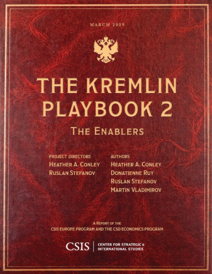 According to Ambassador Steinacker, the most concerning issue is the lack of response and action. She called for immediate actions by the prosecution of the counties in the region to investigate large construction projects and other activities with high corruption risks. 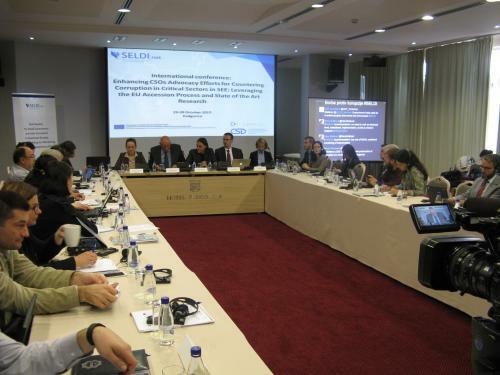 She noted that EU should consider another approach at least for the SEE region, tailored to its traditions and history, in order to achieve practical results of the fight against corruption. 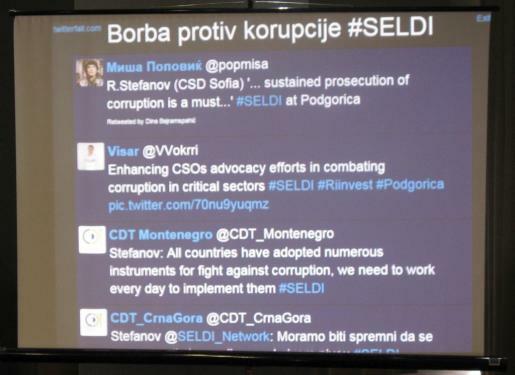 In that regard SELDI is an important network and can contribute to the honest discussion about high level corruption. 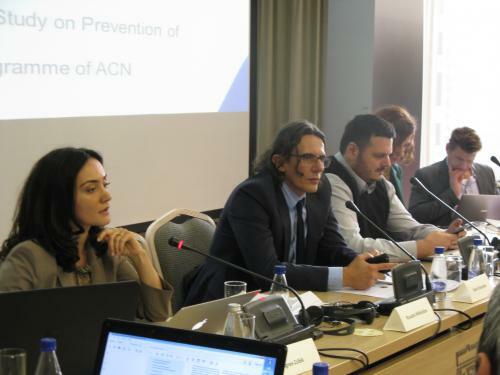 Ms Rusudan Mikhelidze, Project Manager, Anti-Corruption Network for Eastern Europe and Central Asia, Organisation for Economic Co-operation and Development presented the OECD anti-corruption activities and programmes. She highlighted that civil society is involved in their monitoring work and have been active in submitting alternative reports. As good examples she listed the open data portals operating in various countries. She concluded that by using research and monitoring tools in the right way, the international organizations and the society can create pressure and hold governments accountable. 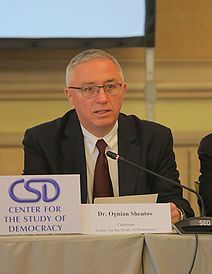 Mr. Dejan Milovac, Deputy Executive Director and Investigative Center Director of the Network for Affirmation of the NGO Sector – MANS, Montenegro noted that the largest challenge of the CSOs is to translate the available data into political recommendations, as well as to obtain political support. He underlined that change is difficult, though possible – after many years of work MANS has succeeded in initiating changes in the criminal law. Recently it has launched a public campaign to draw attention towards the illegal enrichment of public officers and is aiming to promote the passing of a separate law dealing with that phenomena. He recommended that CSOs make the media their ally. 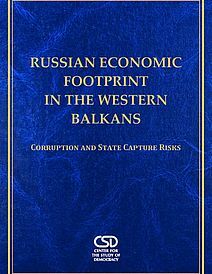 In that way the media can explain better the damage from corruption to the general public – a topic rarely discussed properly in the public sphere, especially regarding the high-level profile corruption. Mr. Milovac noted that there is certain progress in Montenegro in terms of legislation, however the policy implementation is not in place. Mr. Garret Tankosic-Kelly, Principal, Southeast Europe Change Net underlined that there are large amounts of unspent grants and loans for energy efficiency available. He noted that despite that energy efficiency creates more jobs than energy production, the governments in the region concentrate mainly on the latter. He recommended that CSOs carefully analyze the developments in the energy sector and watch for corruption risk patterns in the way energy is produced, distributed, imported and exported. CSOs should also monitor who appoints the energy regulators, and if they change every time a government changes. 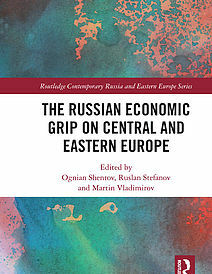 Mr. Martin Vladimirov, Analyst at the Economic Program of the Center for the Study of Democracy, Bulgaria listed the key energy security risks of the region – energy expenditure intensity, unsustainable import dependency, low energy efficiency, widespread energy poverty, and governance deficits. Mr. Vladimirov stressed that if the energy market is liberalized, it will be less liable to corruption. He recommended that the countries ensure security of supply and diversify their energy sources. 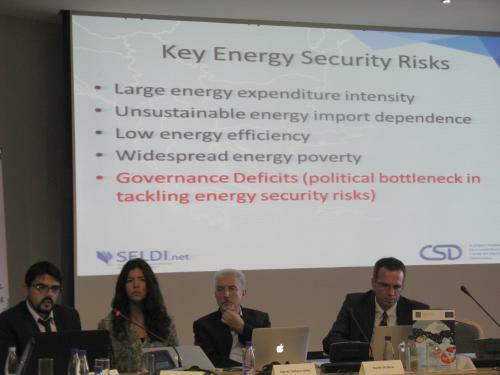 CSOs and the SELDI initiative should look at the main red flags such as low liquidity, cases of conflicts of interest, lack of independent technical and economic analysis or feasibility study before an energy project is realized, politically driven decisions, application of exclusive criteria favoring only one bidder, matching of successful bidders with political supporters. 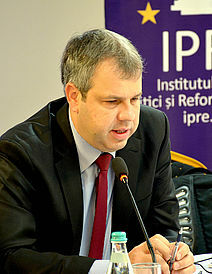 Dr. Boško Mijatović, President of the Center for Liberal‐Democratic Studies, Serbia highlighted that the energy sector is monopolized, and that there is still doubt if open procedure tenders could have brought more value than inter-governmental arrangements for large infrastructure projects. According to him, the politically appointed directors of energy agencies and state companies work in intransparent manner, and do not report on the efficiency of their institutions. He called for strengthened political will for reforms and transparency. 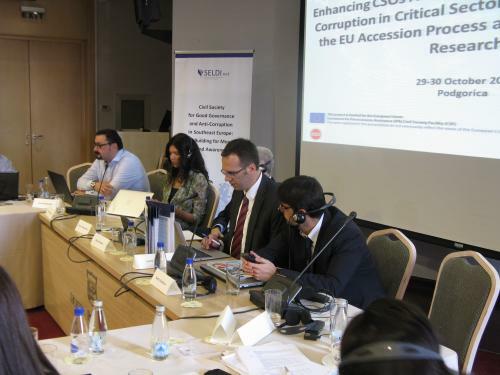 Mr. Visar Vokrri, Advanced Researcher at Riinvest Institute, Kosovo underlined that security of supply presents the largest challenge in Kosovo, since it affects all other sectors. He stressed that political influence on the SOE is an issue that requires immediate attention. 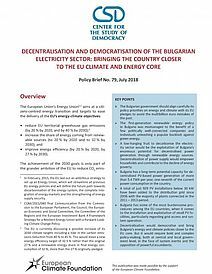 A challenge presents the fact that the third energy package has not been fully transposed in the legislation and the process of further unbundling and liberalization of the sector has been slow. In addition, the licensing procedures are bureaucratic and unclear, and do not serve as incentive for potential investors. 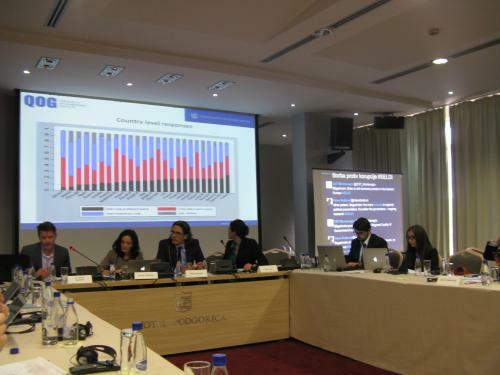 Mr. Đorđije Brkuljan, Deputy Executive Director and Coordinator of Program "Good Governance", Center for Democratic Transition (CDT), Montenegro noted the serious lack of data on oil imports, consumptions and stocks. Public procurement information is not easily available and is not in open format. He recommended that the application of the competition law in the energy sector is critically assessed. Mr. Brkuljan also expressed concern about the construction of hydro and coal power plants and their potential impact on the environment. Ms Ceren Zeytinoğlu, Expert, Good Governance Program, Turkish Economic and Social Studies Foundation stressed the complete control of gas and its transit by a single company in Turkey, the mismanagement of renewable energy sources, corruption risks in the legal framework for environmental assessments, and the controversial views regarding the construction of nuclear power plants. She concluded that the public procurement law has been changed many times and there are doubts for mismanagement of energy projects. Ms Eugena Topi, Research Assistant, Albanian Center for Economic Research (ACER) presented the main issues in the energy system of Albania, including the challenges of unbundling the system, financial mismanagement and political dependence of the state-owned enterprises (SEO) manifested in large debts. 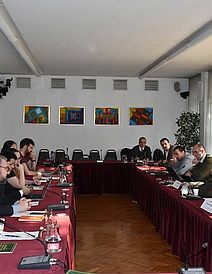 Currently the Albanian population is hoping that the new reform on judiciary will change the inefficiency of the sector. 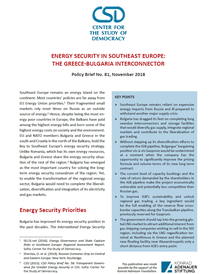 Ms Emilija Tudzarovska-Gjorgjievska, Project Officer, Macedonian Center for International Cooperation (MCIC) noted the need for increase of the role of Energy Regulation Commission. She recommended that the privatization of power plants is carefully monitored for corruption risks. 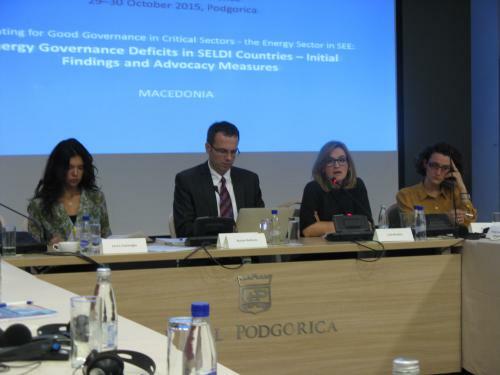 Ms Leila Bičakčić, Executive Director of the Center for Investigative Reporting underlined that Bosnia and Herzegovina has not been able to fulfill the energy community requirements. According to her, the potential for production of renewable energy remains unutilised, while the main investments are directed towards the coal industry. 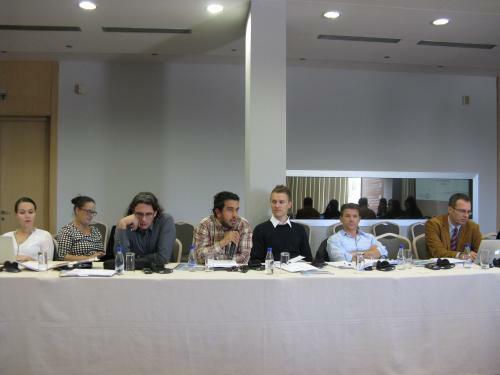 On 30 October 2015, the participants in the conference exachaged experience in achieving CSOs' advocacy and impact. Mr. Hans Gutbrod, Coordinator of Transparify presented the five-star rating of the CSO transparency standards and stressed that CSOs should be responsible and accountable to the citizens. He noted the trend of increased CSOs transparency, observed since 2013, and congratulated the SELDI members with high transparency scores. 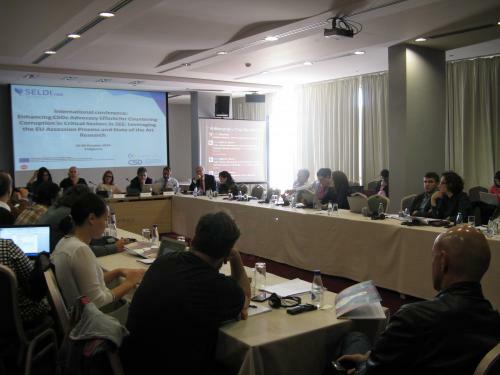 CSOs can obtain further information on how they can become more transparent at www.transparify.org/get-five. 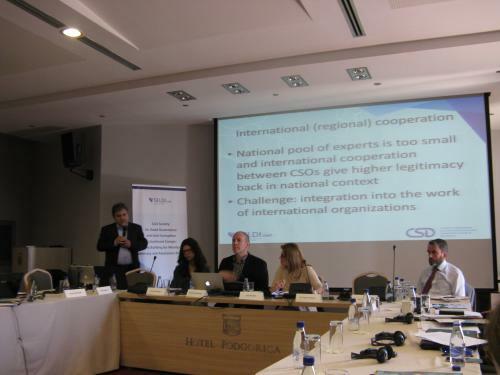 Dr. Todor Yalamov, Assistant Professor at Sofia University recommended that CSOs achieve organizational and management excellence, citizen engagement, integration into the national policy infrastructure and prepare to face new entrepreneurship challenges in order to lead the policy change. Among the helpful skills needed in every CSO, he listed the IT assets, publication of annual reports, use of ISO standards in internal processes’ management, establishment of working relations with investigative journalists, and the use of the social networks. 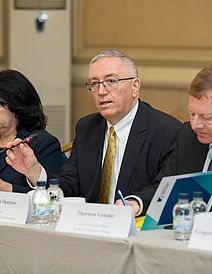 As a key challenge Dr. Yalamov identified the integration of CSOs into the work of international organizations, which is needed when the national pool of experts is very small. 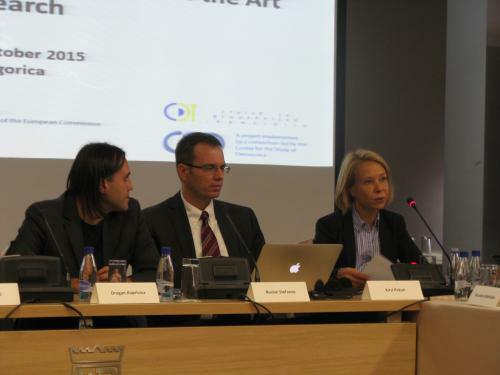 Mr. Matthew Brunwasser, Belgrade-based journalist shared some observations of his work with investigative media. He expressed concern that most journalists report only the information that people in power provide, and do not question or analyze the real situation. Despite the fact that during the last 20 years the freedom of the press has increased substantially, the quality of media articles remains low. This is due to the political ownership of the media outlets. 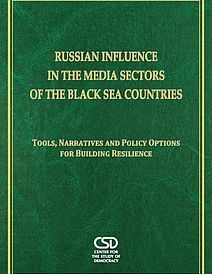 Even the technical advance and the emergence of the online media has not resulted in stronger democracy, as the journalists are still not used to challenge the misconducts of oligarchs and to create local demand for anti-corruption. Ms Ceren Zeytinoğlu, Expert, Good Governance Program, Turkish Economic and Social Studies Foundation presented the advocacy efforts of TESEV and its success in bringing together academics and policy-makers. She noted the importance of civil society effecting the parliamentary debate and inducing political change, for example in regard to the new constitutional process in Turkey and the reforms of the Public Administration Law. She stressed that CSOs should constantly rethink their objectives and expand their research areas according to the changing economic and political environment. 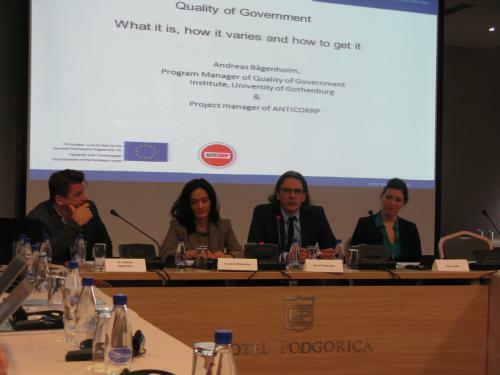 Mr. Munir Podumljak, Executive Director of the Partnership for Social Development, Croatia presented the public procurement database www.integrityobservers.eu – a result of more than 10 years of work. 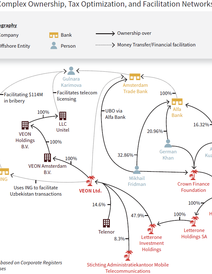 The database shows real time data of public procurement contracts, type of procedure, name of the contactor. 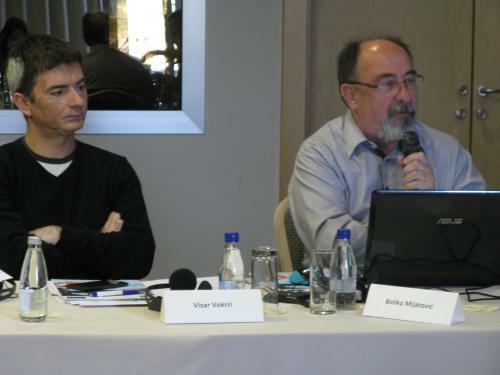 Mr. Podumljak also presented the project www.fairpress.eu which exposes the clientelism in media. 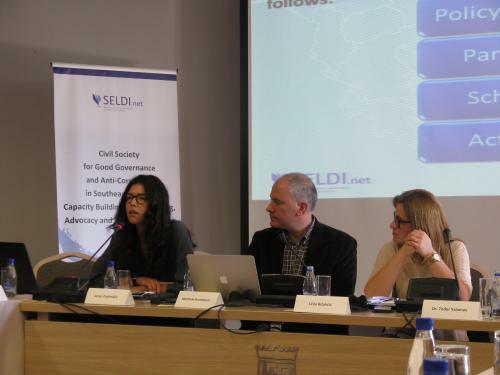 Ms Milica Bogdanović, ICT Coordinator and Online Portal Editor, Center for Democratic Transition (CDT), Montenegro stressed on the importance of combining advocacy and journalist methods, such as the use of social media and infographics. She presented an example from CDT’s efforts to change the law on financing of political parties including face-to-face meeting with policy makers and thematic articles published on the CDT website. She recommended that CSOs prepare simple and easy to understand messages to the public. 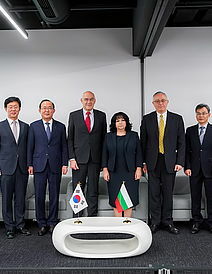 Ambassador Victor Jackovich, Co-Chair of the Business Advisory Council for Southeast Europe and Member of SELDI International Advisory Board noted that the Business Advisory Council will commit to support the good business practices in the region by signing a Memorandum of Understanding with SELDI. He expressed his believe that structural reforms can succeed if people understand and support them.